Thymio Pappianis for his helpful comments. Lying on a slim finger of land stretching south from the Greek mainland, Mount Athos is a religious center maintained by Orthodox Christian monks for over 1,000 years and one of the only UNESCO World Heritage sites in Europe recognized for both its cultural and natural significance. The geographic isolation of the peninsula has allowed the 20 independent monasteries to protect the land from development, making the area one of the few truly natural ecosystems left in Europe. For Orthodox Christians, Mount Athos is “the Garden of the Mother of God” and the holiest site of their faith. Indeed, subsequent human settlement of Athos has been almost entirely noninvasive. Large-scale human occupation was impractical due to the peninsula’s rocky terrain. There were likely small settlements after the classical Greek era, but the area was empty when Christian monks arrived in the 10th century. Today, even archaeology to discover ancient settlements is forbidden. Orthodox Christians believe that, after the death of Jesus, the Virgin Mary (known as Theotokos, or Mother of God) sailed to Cyprus, but was blown off course and landed on Athos. She instantly embraced the spectacular landscape of the mountain and its surrounding beaches, praying to her son that the land could be hers. The pagan peoples who lived on Athos were captivated by her devotion and immediately converted. Orthodox Christians regard the lush land as her garden, placing her in a counterpoint to Eve and the original Garden of Eden. 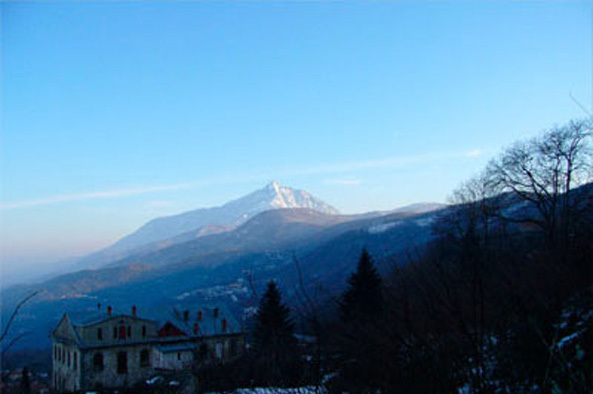 Among Orthodox Christians, Mount Athos is known as “the Holy Mountain,” the simplicity of the title indicating its centrality to the faith. Because it is the garden of the Mother of God, there is a strict ban on women setting foot on Athos, decreed by the Virgin Mary herself. The ban even extends to female domestic animals, which has had the side effect of limiting the growth of animal populations and effectively prohibiting grazing herds. The first monastery, Great Lavra, was founded in 963, although there were informal preexisting communities of monks. Originally, monastic life was strictly communal: everyone would contribute their personal assets to the community and perform work solely for the community’s good, in a system known as cenobitic. Mount Athos was at the peak of its prominence during the Byzantine Empire, when Orthodox Christianity became the official religion of the former Roman Empire and the center of power shifted east to Byzantium (later Constantinople) in 330. Until the conquest of Constantinople by the Ottoman Turks in 1453, the monks of Athos held great power not only in the Orthodox Church, but also in the political machinery of the Byzantine Empire. In the late Byzantine period, as the monastic population began to wane, most monasteries switched to the idiorrhythmic system, which allowed monks to keep their personal assets and to have more individual choice in their lifestyle. This change attracted wealthy aristocrats and others not as strictly devoted to monastic life. With the fall of the Byzantine Empire, Greek culture and spirituality was subsumed under the Islamic Ottoman Empire. The primary role of the monks of Mount Athos then became to preserve Hellenic culture in the face of the empire that ruled southeastern Europe. Following the Greek war of independence (1821-32) and the disintegration of the Ottoman Empire, the monasteries’ role in cultural preservation became less urgent, which may have been a factor in their decline in prominence throughout the first two thirds of the 20th century. To mark the millennium anniversary of Athos, the first road was built in 1963. Despite the celebrations on this year, the 1960s were a worrisome time for those who wanted to see the spiritual culture of Mount Athos remain pure. The monk population had decreased to less than 2,000, down from a peak of 40,000 in the 14th century and 7,500 at the turn of the 20th century. The buildings were in disrepair and the Greek government considered taking more direct control of the area and converting it into a tourist attraction. In the 1970s, there was a push to revive the spiritual traditions of Mount Athos. Some monasteries chose to switch back to the cenobitic system and encourage their members to return to a purer lifestyle. Monks also worked to publish their archives dating from the ninth century, a rich collection that documents the many historic and religious eras to which the Athos monasteries contributed. Several exhibits of cultural and religious artifacts from Mount Athos have since toured the world. This publicity has increased the number of visitors to the area in recent decades. The unique geography of Athos has made generations of visitors feel that they have entered the physical embodiment of a spiritual place distinct from the rest of the Christian world. The peninsula is attached to the mainland of Greece by a narrow strip of land that is now walled off, making Athos an island unto itself. Thus, the only legal approach is by sea. The mountain itself is 2,030 meters high, but the awe-inspiring quality of the landscape comes from its location right next to the beach and the rich variety of flora and fauna to be found at different altitudes. Climatic zones range from alpine, at the peak of the mountain, to Mediterranean along the coast. The vegetation, unlike almost anywhere else in southern Europe, is completely intact because of the lack of grazing flocks on the peninsula. Trees cover 90 percent of the mountain. The coastal and marine environments also have important species, including monk seals. In governance, too, Athos is independent: the 20 monasteries each control their own land base and a representative from each monastery serves on the parliament of the Holy Community to decide issues of importance to the entire peninsula. Scattered hermitages and independent settlements also exist on the island. Karyes, the capital of Athos, is found high up the mountain with a small population of 300 to 400. Aside from the limited supervision of the civil governor and police force provided by the Greek government, Athos functions autonomously and symbolizes a transnational faith community. Seventeen of the monasteries are Greek-speaking; the remaining are Russian, Serb, and Bulgarian. However, the resident monks are from all over the world, and the diversity of the population has increased in recent decades. The monasteries come not under the jurisdiction of the Greek church, but that of the Ecumenical Patriarch of Constantinople. The monks continue to observe Byzantine time, which starts the clock for each day according to the sunset of the previous day, and the Julian calendar, which is 13 days behind the Gregorian calendar used by most of the world. Today, Mount Athos remains the spiritual center of Orthodox Christianity, distinct from other centers of world religions because of its natural setting. The governance of the peninsula is a model of direct democracy combined with spiritual principles, and the religious significance of the “garden of the Mother of God” has protected the alpine and coastal habitats. Athos monasteries operate several schools devoted to painting religious icons, maintaining a visual style that has been copied around the world. They are also charged with the care of a millennium’s worth of manuscripts and artifacts, including frescos, collections of religious icons, relics such as bones of a saint and fragments of the “true cross,” and texts including medieval illuminated manuscripts and ancient Greek literature. The architecture of the monastic buildings themselves tells the history of the last millennium. The monks practice small-scale industry: timber harvesting, grape cultivation and wine making, beekeeping, and olive cultivation. These operations provide just enough food and income to maintain the monastic communities, although some commercial timber harvesting is permitted. The marine and coastal regions of the peninsula are relatively pristine, thanks to a ban on commercial fishing and the inhospitable terrain of the coast, which discourages any human activity except for the docking of boats. Timber harvesting is a potential problem, particularly the planting of chestnut trees for harvesting, which has led to parasite attacks. However, the scale of forestry remains relatively modest due to the costs of transport to and from Mount Athos. Other areas of concern include commercial buildings built by the timber industry, construction of unnecessary roads, and waste disposal, for which a peninsula-wide management plan must be initiated. Fire is of significant concern to the preservation of old buildings because of their wooden structures and antiquated heating systems. When left to themselves, the monks exhibit a high degree of respect for the environment, owing to their belief that it is the garden of the Mother of God and the simplicity of their lifestyle. However, large volumes of visitors threaten the delicate ecosystem, and because of the short duration of their stay, they are less likely to recognize their impact on the environment. Most of these visitors are pilgrims to the monasteries, though visitors also include building and forestry contractors. The monks continue their tradition of offering free hospitality to visitors, most of whom are religious pilgrims. But in order for the monasteries to continue their way of life and keep Mount Athos free of development, the number of visitors must be limited. The Holy Community has instituted quotas for visitors, giving preference to those of the Orthodox faith. At the same time, the monks recognize the importance of recruiting young monks to join their communities, to prevent the kind of decline seen in the 1960s.The monks seek to balance their traditional role as hosts to pilgrims with the reality of the impact large numbers of visitors have on the monastic communities—economically, ecologically and spiritually. Mount Athos has received several protected designations designed to assist in preservation efforts. In 1988, the area was added to the UNESCO World Heritage List, recognized for both its natural and cultural aspects. It is also part of the Natura 2000 network, a cooperative project sponsored by the European Union to protect distinctive and endangered European natural sites. This designation requires the Greek government to care for the site under its Ministry of Environment, Physical Planning and Public Works. However, the department labors under a shortage of staff and funding relative to the areas it must maintain. Because of the autonomy of the monasteries, it remains to be seen how the Holy Community can work with the Greek government for a more organized conservation structure. Mount Athos needs a management plan created in consultation with the Holy Community and the Greek Ministries of Culture and of Environment, Physical Planning and Public Works. To some extent, comanagement with a secular government is seen by the monks as a threat to their long tradition of self-government, but the need for cooperation to preserve Athos’ unique qualities has become clear. The management plan should contain a coordinated plan for the entire peninsula along with specific recommendations tailored to each monastery. The majority of monasteries have created forest management plans in consultation with forestry professionals. Timber harvesting above the amount needed for the monasteries’ own uses should be regulated by an international forestry certification system to ensure sustainable harvesting. The Holy Community has also agreed to work with Aristotle University of Thessaloniki on a risk assessment study, covering both fire and seismic activity. Delos Initiative. “Mt. Athos – Greece.” The Delos Initiative. Mediterranean Institute for Nature and Anthropos. Med-INA.org. Speake, Graham. Mount Athos: Renewal in Paradise. New Haven, Conn. and London: Yale University Press, 2002. United Nations Educational, Scientific and Cultural Organization. “Mount Athos.” UNESCO World Heritage Centre.